For the holidays you'll draw up lists of ingredients. You'll bake pies and other desserts. You'll spend all day in the kitchen roasting and basting. You'll choose colorful root vegetables to prepare. You'll whisk gravy made from scratch. And will you merely open a can of cranberries? 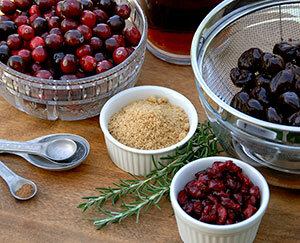 Try making your own cranberry sauce this time and you will never go back to the canned kind. You can make it ahead of time, up to a week if you like, and pop it in your refrigerator in a container. The following recipe is super quick and easy to make. It'll take 15 minutes while you are doing other things in your kitchen. And the taste is unbelievably yummy. This is cranberry sauce so good you'll almost want to serve it for dessert. 12 ounce can cranberry juice concentrate?? 1. Rinse the cranberries in a colander. Pick out any stems or green berries. 2. In a heavy saucepan combine the cranberry concentrate with water, brown sugar, cinnamon, and allspice. Bring this mixture to a boil over medium heat. Stir until all sugar is dissolved. Add the cherries, turn the heat down slightly, and cook for an additional two minutes. 3. Now add the cranberries. Continue cooking, until all the berries have popped open. This takes five to ten minutes. Give it an occasional stir. Pour the sauce into a container, cover, and refrigerate until you are ready to serve. It is delicious whether served cold or warmed to room temperature.